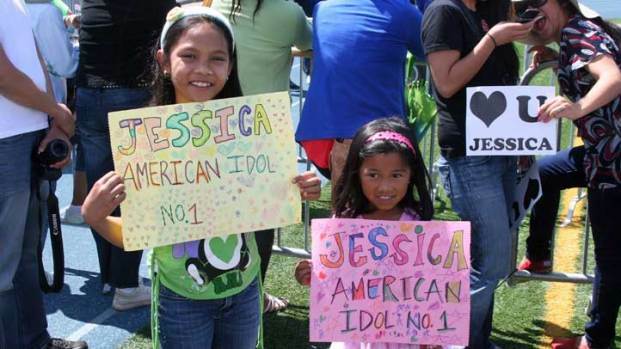 The Eastlake teenager made it to next week's finale of "American Idol"
Jessica Sanchez sang Aerosmith's "I Don't Want to Miss A Thing" on American Idol Wednesday night. Friends and fans of the 16-year-old packed Eastlake Tavern and Bowl Wednesday night to watch the show. Sanchez, who visited her hometown just a few days ago, attended Eastlake Middle School and participated in the choir there. “She’s a great singer, who wouldn’t agree,” said Jordan Solaita. A co-worker, who is also the young singer’s cousin, first introduced Sanchez' voice to Solaita. “She took it back old school and I liked it a lot,” he said. The results of which two singers are heading to the grand finale were announced on American Idol Thursday night. In the end, it was announced that Jessica Sanchez, along with Georgia’s Phillip Phillips, will compete for the title next week. The winner will be crowned Wednesday.